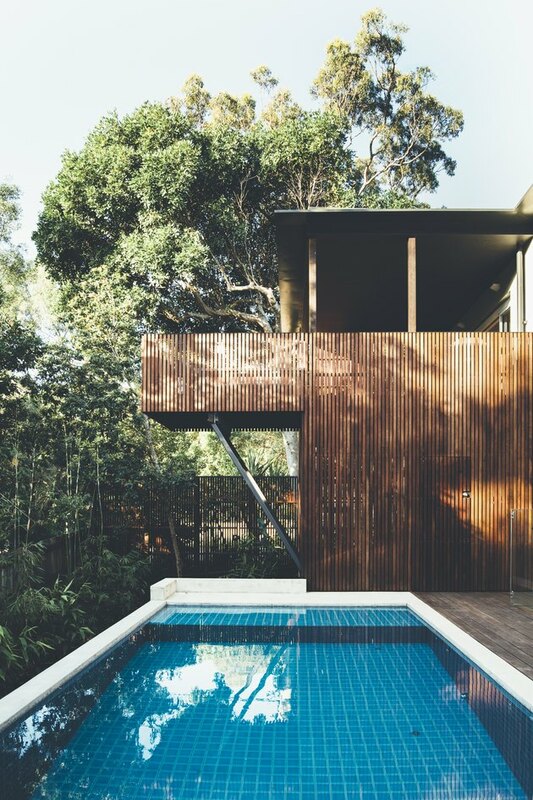 Neighboring Noosa National Park, with picturesque surfing beaches on one side and a subtropical rainforest on the other, a 1970s-era brick home got a makeover from Queensland-based architectural firm Teeland Architects. The residence, enclosed in dark amber bricks, was reconstructed using as much of the existing structure as possible to give the homeowners a dreamy view of the surrounding landscape. Before the renovation, the rear of the house excluded views of the beauty lying just outside the wall. 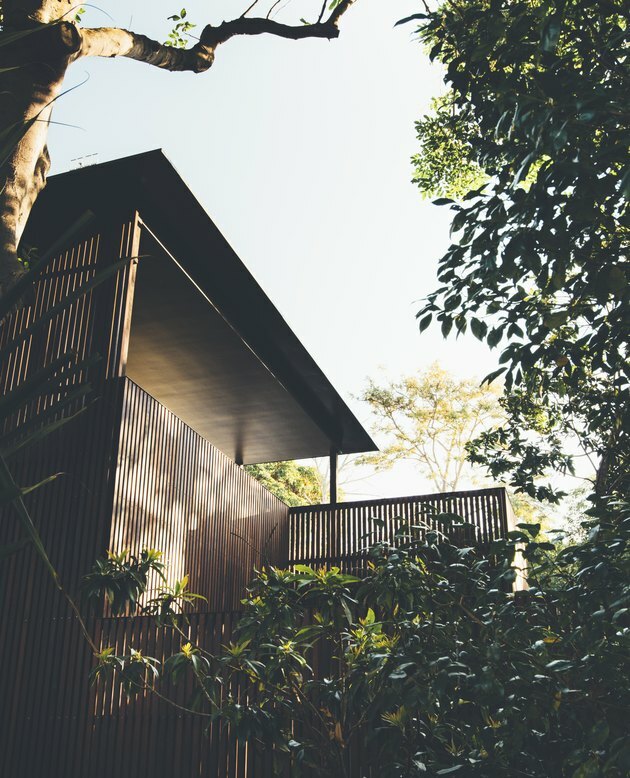 To remedy this, the firm carved out a series of new openings so that the private areas — the bedrooms and bathrooms — would feature views of the land. This also allowed more natural light to flow through, rectifying another problem, the dark interior of the original design. The end result is a home that balances privacy and openness. By adding a timber wood screen to the front street entrance and rendering the drab brick in a natural cement finish, the architectural team was able to keep the structure of the building while updating the look. The front facade screen gives the family privacy from the street elevation while the back end of the home is more open and fluid. The timber from the exterior is mirrored in furnishings from the interior — there's a timber bed and an outdoor timber lounge chair. 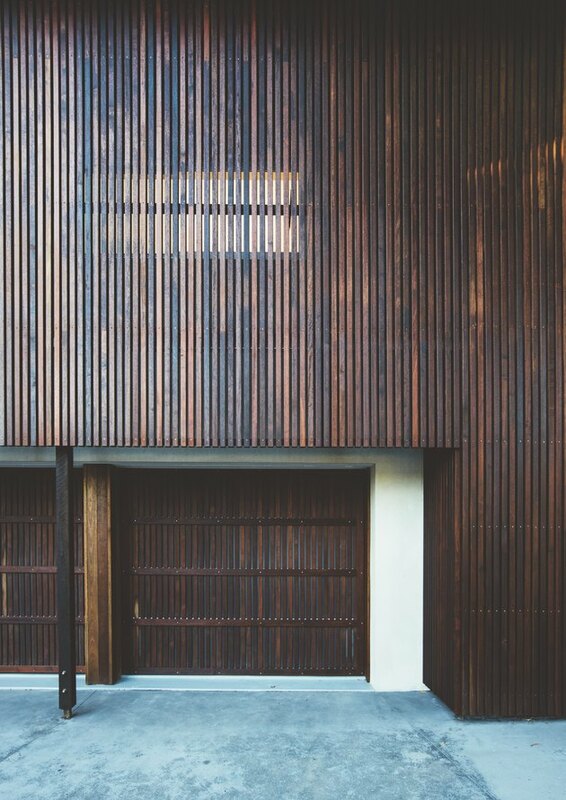 By adding a wood exterior, the home feels more in harmony with the outside. The timber-lined light wells on the roof allows natural light to flow freely. 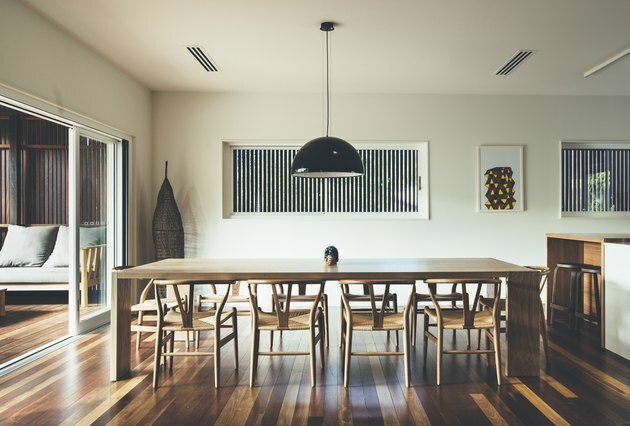 The dining table was custom-built from American oak by Mast Furniture. The table is surrounded with natural oak wood Wegner chairs. 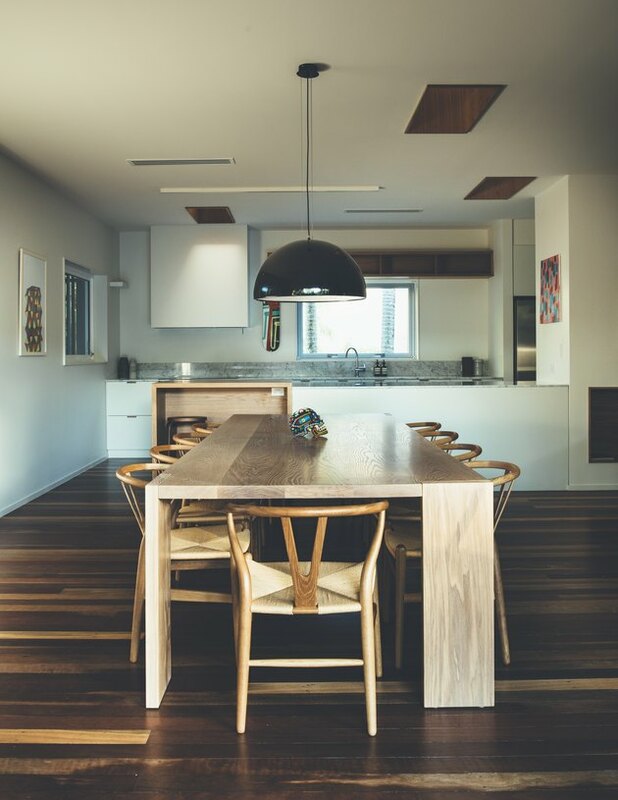 The lighting above the dining table is a Marcel Wanders Skygarden pendant light in a black finish. The lustrous texture is matched in the kitchen island's surface, which features bar stool seating. 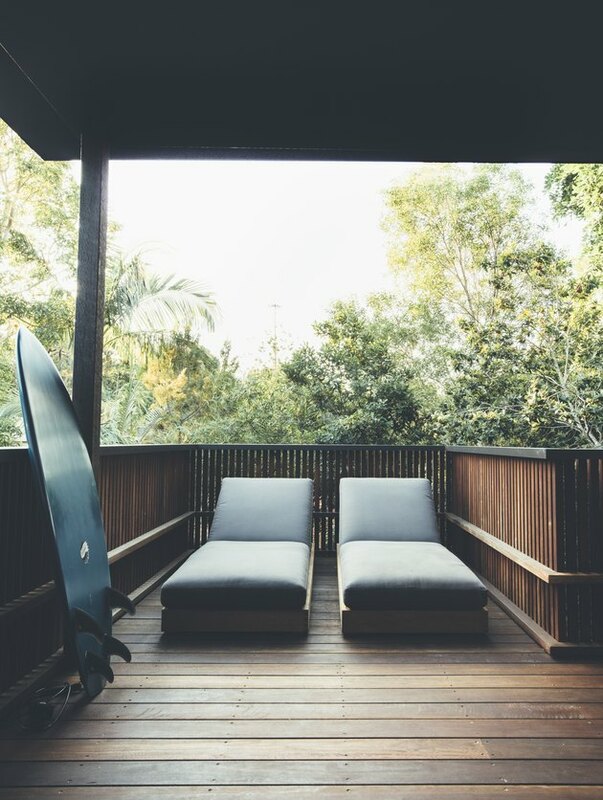 In the master bedroom, a custom-made outdoor lounge chair and ottoman were created by Mast Furniture. A glass porch barrier allows the view to be uninterrupted. 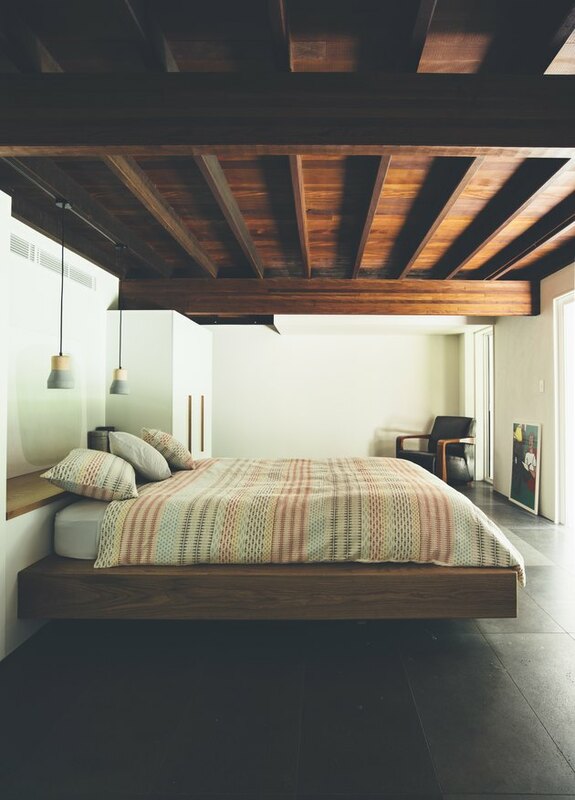 The bed in the master is custom-designed, constructed from American oak. Throughout the home, natural light coexist with luminescent glow lamps. 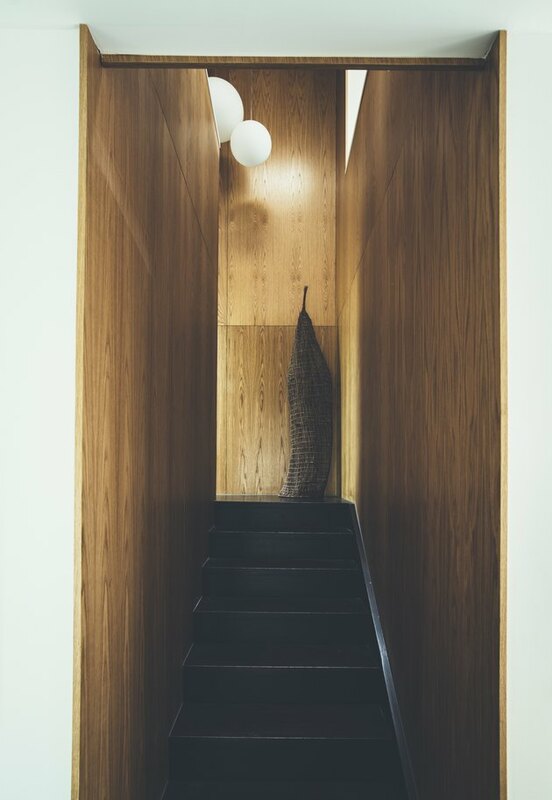 In the dark stairwell, a hand-blown Jasper Morrison Glo-Ball S2 pendant light with white glass leads the way. 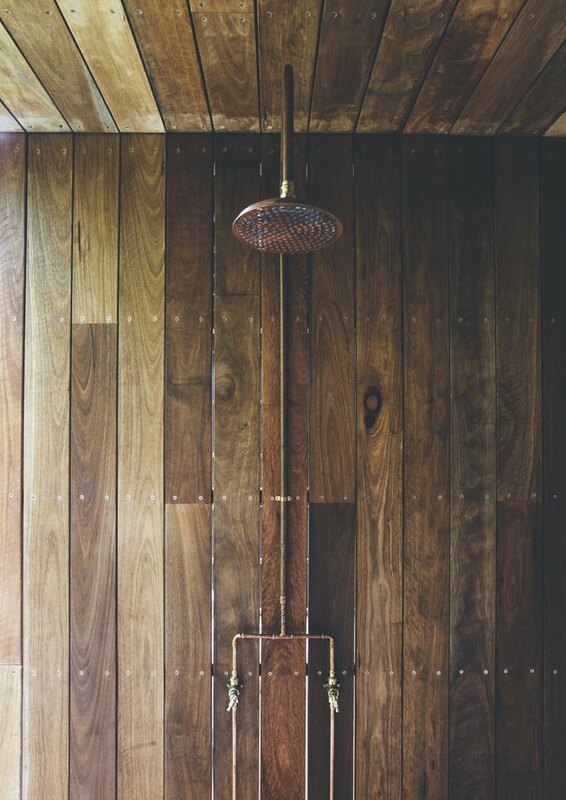 The team designed an open-air shower space, complete with copper fittings. The interior is decked out in minimalist modern furnishings — such as a clock from the MoMA Design Store. 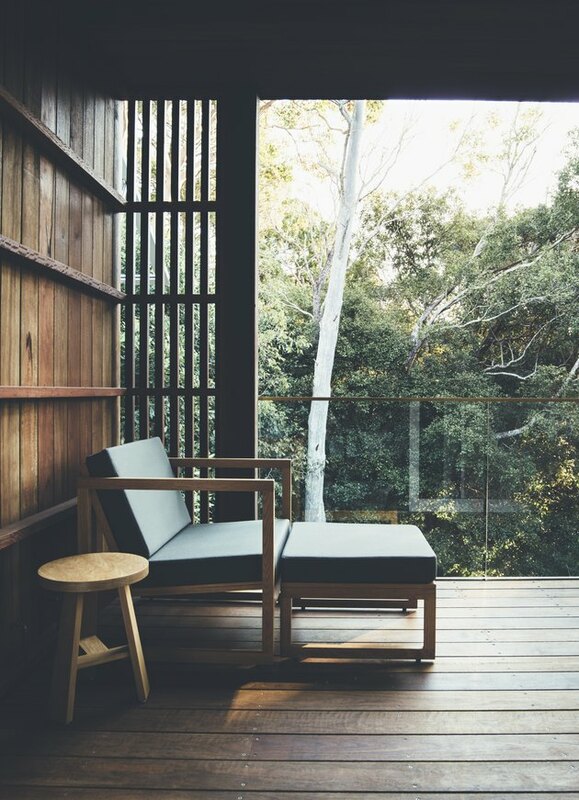 The exterior patio mirrors these design sensibilities with a timber outdoor chair built locally by Mast Furniture and a Flynn side table by Jardan.